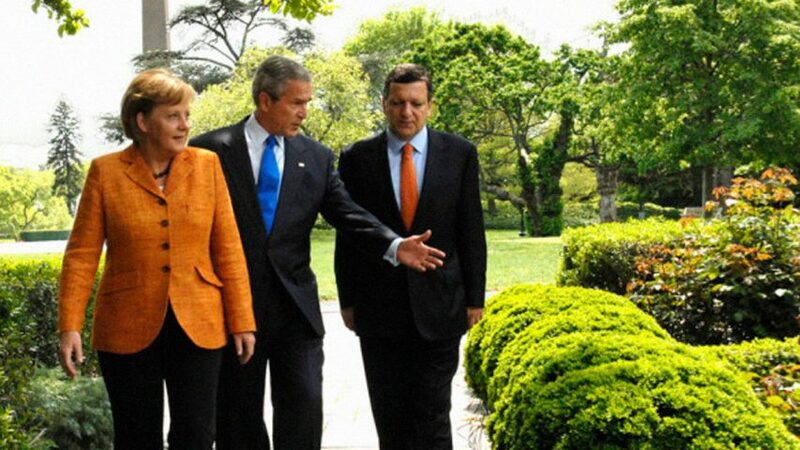 German Chancellor Angela Merkel (Left), US President George W. Bush (center) and European Commission President José Manuel Barroso at EU/US Summit, April 30, 2007, The White House, Washington, DC. The agreement they signed threatens the harmonizing of U.S. dietary supplement legislation to restrictive European regulations. Because the signing of this agreement received only minimal media coverage, U.S. consumers could perhaps be forgiven for assuming that its potential to affect the regulation of dietary supplements was negligible. In reality, however, not only does the existence of a secret “confidentiality agreement” signed by the FDA with its European counterparts in 2005 now threaten the harmonizing of U.S. dietary supplement legislation to restrictive European regulations, but the European Commission President, José Manuel Barroso, has specifically stated that the pharmaceutical sector will be one of the areas that would benefit the most from transatlantic regulatory cooperation. Meeting of the Codex Alimentarius Commission in Rome, July 2005. 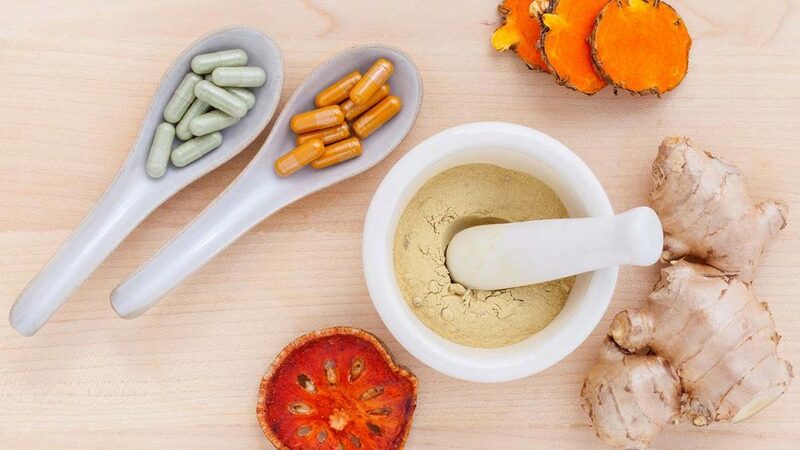 Following the Commission’s adoption of its restrictive ‘Guidelines for Vitamin and Mineral Food Supplements’ as the new global regulatory standard for dietary supplements, the threats to natural health therapies are becoming increasingly international in nature. Historically speaking, regulatory threats to natural health therapies have almost exclusively been of a national, as opposed to an international, nature. In the United States (U.S.), for example, the pharmaceutical industry-inspired Advance Notice of Proposed Rulemaking (ANPR) that was published by the Food and Drug Administration (FDA) in June 1993 – which suggested, among other provisions, that vitamins and minerals contained in dietary supplements be limited to low multiples of the Recommended Daily Intakes (RDIs) – would not, had it been implemented, have directly affected consumers living outside of the U.S.. Similarly, in the United Kingdom (UK), the unsuccessful attempt by the Blair government to limit the maximum permitted level of vitamin B6 in supplements to 10 mg in the late 1990s would not, had the proposal become law, have affected the freedom of choice of consumers living in other countries. Following the creation of the World Trade Organization (WTO) in 1995, however, and the subsequent adoption by the Codex Alimentarius Commission, in 2005, of the controversial Guidelines for Vitamin and Mineral Food Supplements, regulatory threats to natural health therapies are becoming increasingly international in nature. The WTO uses Codex standards as the benchmark in its adjudication of international trade disputes involving foods and, as such, Codex standards that had once been entirely voluntary now have the bite of law in the global trade system – thus giving Codex coercive authority and WTO Members very real incentives to harmonize their regulations by adopting its standards. Moreover, the key methodology via which countries are increasingly harmonizing their domestic regulations with those of their neighbors is by organizing themselves into regional trading blocs. Membership of such blocks – which can take the form of free trade areas, customs unions, common markets and other forms of economic integration – increases the pressure upon countries to harmonize their regulations and, in the case of food and dietary supplements legislation, to base them upon Codex standards. Six nations established the European Economic Community by signing the Treaty of Rome, above, in 1957. Now consisting of 27 member countries, the European Union is the world’s largest trading block. Its restrictive Food Supplements Directive was used as the blueprint for the controversial Codex ‘Guidelines for Vitamin and Mineral Food Supplements’. The European Union (EU) is the world’s largest – and arguably the most powerful – trading block. Established by the Treaty of Rome in 1957, its number of member countries has grown over the past fifty years from the original six participants to a current total of twenty-seven. This dramatic growth has naturally resulted in a parallel increase in the EU’s economic and political power, the most obvious example of which – from a natural health perspective – being at Codex meetings, where it is now effectively able to shape the drafting of global food and dietary supplement standards to reflect European law. In this respect, it is particularly notable that the Codex Guidelines for Vitamin and Mineral Food Supplements (which, unlike the United States’ relatively liberal Dietary Supplement Health and Education Act of 1994 (DSHEA), contain a requirement for maximum nutrient levels to be set) utilizes the EU’s highly restrictive Food Supplements Directive as its blueprint. As such, it is with these facts in mind that the signing of the new transatlantic agreement – and the commercial and political influences that led to it – must be examined. The new Transatlantic Economic Council will be chaired by U.S. National Economic Council director Allan Hubbard (left) and European Commission Vice President Günter Verheugen (right). Together, they will oversee the efforts to achieve transatlantic regulatory convergence in nearly 40 areas. The agreement signed by U.S. President George Bush, European Commission President José Manuel Barroso and German Chancellor Angela Merkel as head of the German term of the rotating EU Presidency has three main components. Firstly, it has a regulatory focus on finding ways to converge the different regulatory structures and regulatory approaches of the United States and the European Union. In this respect, it is significant that the Senior Administration Officials who conducted the post-summit press briefing specifically stated that they had “interacted with the business communities on both sides of the Atlantic” and that the feedback that they’d received was that the different regulatory frameworks of the United States and European Union “pose real barriers to economic advancement and growth.” Perhaps not surprisingly, therefore, and as we shall discover, the pressure to deliver this agreement came from some of the world’s most powerful multinational corporations, including the pharmaceutical industry. The second key component of the agreement is a set of priority projects focused on intellectual property rights, trade, financial markets, consolidation, investment promotion and technology. Finally, the agreement also includes the setting up of a Transatlantic Economic Council, to be chaired by U.S. National Economic Council director Allan Hubbard and European Commission Vice President Günter Verheugen. The Council will be a permanent body and will oversee the efforts to meet the agreement’s objectives, with the goal of accelerating progress and achieving regulatory convergence in nearly 40 areas. 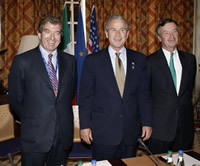 President Bush has close links to the Executive Board of the Transatlantic Business Dialogue (TABD), having met personally – at an EU-U.S. summit in Ireland in June 2004 – with TABD EU chairman Niall FitzGerald (Chairman and CEO of Unilever) and interim TABD US chairman Michael Eskew (Chairman and CEO of UPS) to discuss TABD’s recommendations for a barrier free transatlantic market. The creation of such a market – to include the harmonising of EU-U.S.dietary supplement regulations – has long been TABD’s goal. Originally the idea of the late U.S. Secretary of Commerce Ron Brown, it has long been the stated goal of the TransAtlantic Business Dialogue (TABD) to establish a Barrier-Free Transatlantic Market. Given this objective, it is hardly surprising that TABD’s Executive Board Companies comprise some of the world’s richest and most powerful corporations and include the pharmaceutical manufacturers Merck, Pfizer, AstraZeneca and BASF. In the run-up to the April 30 summit, TABD issued no less than three separate press releases in which it recommended that a barrier-free transatlantic market should be established, urged that time was running out for the U.S. and EU to tackle trade barriers and stated that it was time for the transatlantic political process to catch up with the deep integration already achieved by the business community. Clearly, given the size and economic power of its Executive Board Companies, these press releases translated into a great deal of pressure upon President Bush, President Barroso and Chancellor Merkel to deliver what TABD required. 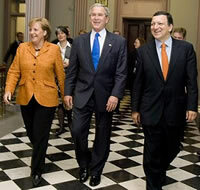 That said, however, there can be little doubt that all three of the signatories were fully supportive of the agreement’s aims – particularly so Chancellor Merkel, who had already promoted the idea in a previous meeting with President Bush at the White House in January, only four days after Germany assumed the rotating presidency of the 27-nation European Union. Moreover, a mere eight days after the signing of the agreement, in a further demonstration of TABD’s political influence, Merkel, accompanied by European Commission Vice President Günter Verheugen – who along with U.S. National Economic Council director Allan Hubbard will chair the new Transatlantic Economic Council set up by the agreement – was a guest at TABD’s Innovation Conference Healthcare in Berlin. The closing speech at the TABD Conference was given by Verheugen, who especially stressed “the crucial role of Chancellor Merkel and the German Presidency in catalysing the new EU-US Framework” and praised “Its organiser, the Transatlantic Business Dialogue which has been central in making the case for transatlantic economic integration.” Even more significantly, perhaps, a large proportion of Verheugen’s speech was given over to a discussion of the benefits of regulatory cooperation in which he specifically cited pharmaceuticals as an example. President Bush, meanwhile, is already known to have his own close links to the TABD Executive Board, having previously met with it to discuss TABD’s recommendations for a barrier free transatlantic market at an EU-U.S. summit in Ireland in June 2004. Crucially, therefore, and as we shall discover, although dietary supplements are not specifically mentioned in the agreement itself, the paper trail that led to its signing strongly suggests that they may already be scheduled for transatlantic regulatory harmonization in the not-so-distant future. Achieving harmonization of the regulatory framework for vitamin and mineral food supplements on both sides of the Atlantic – including the setting of maximum levels – has been a specific aim of TABD since at least November 2000. However, whilst the passing of DSHEA in the U.S. in 1994 created what is still arguably the most liberal regulatory environment for dietary supplements in the world, the current situation in Europe could hardly be more different. In the majority of European countries, for example, the availability of dietary supplements is far more limited and, in those that are available, the doses are frequently limited to amounts that are below therapeutic levels. Worse still, even those few European countries where supplements have traditionally been regulated in a relatively liberal fashion – such as the UK, Ireland, Netherlands and Sweden – are now at risk of losing their access to effective supplements as a result of the passing by the European Parliament of the highly restrictive Food Supplements Directive in 2002. However, as well as requiring the setting of maximum permitted levels for vitamins and minerals in supplements – the specific amounts for which are expected to be announced later this year by the European Union’s executive body, the European Commission – the Food Supplements Directive also restricts the sources of these nutrients to those (largely synthetic varieties) that are contained on its so-called “positive list”. Under the Directive’s requirements, any manufacturer wishing to use types of vitamins or minerals other than those specified on this list is required to submit a safety dossier for evaluation by the European Food Safety Authority. Moreover, because the Directive was used as the blueprint for what is now effectively the global standard for dietary supplement regulations – the Codex Guidelines for Vitamin and Mineral Food Supplements – European regulations are, by definition, already compliant with that standard. As such, it is clear that in order to achieve the goal of transatlantic harmonization, American dietary supplement legislation will have to be harmonized to the restrictive European model, as opposed to the other way around. Given this reality, one should perhaps not be surprised to discover that regulatory cooperation between the FDA and DG SANCO (the European Commission’s Health and Consumer Protection Directorate) is already well advanced. Objective: Cooperation between FDA and DG SANCO on issues of mutual interest in the field of nutritional labelling. Progress/Results: Experts from FDA and DG SANCO are engaged in discussions on regulatory issues relating to health claims, nutrition labeling, fortification, supplements, and infant formula. Specific areas under discussion include: 1) possible collaboration on the EU’s Estimated Average Requirement (EAR) and the U.S. Recommended Daily Allowances (RDA) for nutrients; and 2) cooperation on food labels. Next Steps: Identify specific activities for cooperation on technical issues such as reference values for nutrient labeling, nutrient definitions, and energy conversion factors. Pursue a confidentiality arrangement to facilitate the sharing of non-public information in this subject area. Ironic, isn’t it, that regulatory bodies supposedly promoting transparency find it necessary to pursue a “confidentiality arrangement” and the sharing of non-public information when dealing with issues related to nutrition and supplements? In addition, however, the 2005 Roadmap also reveals extensive cooperation between the FDA, the European Commission’s DG Enterprise and Industry/Pharmaceuticals Unit and the European Medicines Agency (EMEA) in relation to pharmaceutical products. It also contains proof that personnel exchanges, joint meetings and the sharing of documents are all now taking place between these agencies. Further evidence in respect of these activities was subsequently revealed in the June 2006 Joint Report on the Roadmap for EU-US Regulatory Cooperation, which discloses that the “confidentially arrangement” for the sharing of non-public information in relation to nutritional labeling was concluded in 2005. 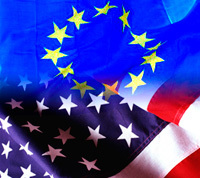 The April 2007 Joint Report on the Roadmap for US-EU Regulatory Cooperation, meanwhile, released to coincide with this year’s summit meeting, shows that over the past two years, U.S. and European authorities have expanded their joint activities significantly. In the area of pharmaceuticals, for example, FDA, EMEA and DG Enterprise staff have engaged in over 800 interactions on almost 200 topics and conducted nearly 20 scientific staff exchanges and visits in the past year alone. In the area of nutritional labeling, meanwhile, the 2007 Report ominously reveals that an “Implementation Plan” has now been completed under the confidentiality arrangement. Is ‘Free Trade’ really ‘free’? As the politicians and super-wealthy special interests behind the proposed Free Trade Area of the Americas discovered in Miami in 1994, growing numbers of people now recognize that the real beneficiaries of so-called ‘Free Trade’ are not consumers, but the world’s richest and most powerful corporations – including the pharmaceutical industry. In the opinion of this writer, the principle of transatlantic harmonization of dietary supplement regulations is not in itself inherently a bad thing. From the point of view of health freedom campaigners in Germany, for example, who are currently subject to some of the most restrictive dietary supplement legislation on the entire planet, the harmonization of their country’s regulations to those of the United States – DSHEA – would clearly be a cause for major celebration. The problem, therefore, lays not so much in the actual concept of harmonization, but rather in the way in which it is applied. In other words, if the transatlantic harmonization of dietary supplement regulations truly resulted in – to borrow the words of President Bush – “eliminating barriers to trade”, then this writer, at least, would be amongst the very first to celebrate. The more likely outcome, however, according to many of those in the health freedom community on both sides of the Atlantic who have been following these issues closely for many years now, appears to be that rather than “eliminating barriers to trade”, the harmonization of transatlantic dietary supplement regulations will instead – via the banning of the most effective higher-dosed products – result in the actual creation of them. Should this happen – and regardless of whatever ‘consumer protection’ spin the political and regulatory elite may try to put on it – then only the most extreme advocates of globalization would surely argue that restricting consumers’ freedom of choice by the illiberalization of a market constitutes the elimination of trade barriers. More to the point, if the transatlantic harmonization of dietary supplement regulations results in the hard-won health freedoms of Americans being lost, then by no rational means could the trade that results from such an outcome even remotely be described as “free”. All of which simply begs the question: “Who benefits?” Clearly, to answer this, one only needs to look as far as those companies who are the most vocal in support of transatlantic economic integration – especially so given that they include amongst their number some of the most powerful players in the global pharmaceutical industry. 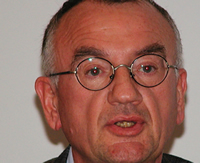 Dr. Rolf Grossklaus, Chairman of the German-based Codex committee that drafted the controversial Guidelines for Vitamin and Mineral Food Supplements by using the European Union’s restrictive Food Supplements Directive as its blueprint. Harmonization to these regulatory standards could eliminate health freedom in America. In some senses, the signing of this transatlantic agreement allows us a glimpse of the bigger picture, thus enabling us to see other current natural health and health freedom-related issues in the United States in better context. For example, whilst there can be little doubt that the FDA is now hell-bent upon eliminating the ability of American consumers to purchase non-patentable natural alternatives to the pharmaceutical industry’s multi-billion dollar market in patented drugs – in that virtually its every action appears to be consistent with this assumption – it can be seen that issues such as the Draft Guidance for Industry on Complementary and Alternative Medicine Products and Their Regulation by the Food and Drug Administration and Bill S. 1082 (the Food and Drug Administration Revitalization Act) are each but single steps in a highly coordinated ongoing plan, as opposed to separate ends in themselves. This being the case – and bearing in mind the signing of the new transatlantic agreement and the existence of the aforesaid FDA-DG SANCO “confidentiality arrangement” – the ultimate aim behind the recent increase in domestically-based attacks on supplements in the U.S. can be seen as being to prepare the ground for the eventual dismantling of DSHEA and the harmonization of the U.S. dietary supplement market to the more restrictive legislative regimes that exist in Europe and – via the planned North American Union – Canada and Mexico. As such, although neither the Codex Guidelines for Vitamin and Mineral Food Supplements – the global standard – or the Food Supplements Directive – the European standard – have as yet set any maximum permitted doses for nutrients contained in supplements, it would seem reasonable to conclude that whatever levels are announced later this year by the European Commission could – as a result of both European political power at Codex meetings and the trans-Atlantic regulatory cooperation outlined above – eventually be exported to, and implemented in, the United States. Direct the majority of your energies into writing and lobbying your Senators, Congressmen and elected State officials. Unlike unelected bureaucrats from the FDA and USDA, elected officials know that if their actions and voting records are not in accordance with the wishes of the majority of their constituents, they risk losing their jobs at the next election. There is a growing realization in the U.S. health freedom community that future access to effective dietary supplements and other natural health therapies is increasingly under threat. However, the question as to how best to deal with this threat is currently the subject of significant disagreement. Some health freedom organizations, for example, urge people to voice their objections directly to the FDA and/or USDA. On occasion, such as where these agencies have specifically asked for public comment on a document, it is true that such responses are sometimes warranted. In reality, however, the FDA and USDA are simply not accountable to ordinary citizens in the way that elected congressional officials are. As such, even when these agencies ask for public comments, the fact is that industry – specifically the large multinational food, drug and agricultural corporations – and the government are far more influential with them than is the voting public. By way of contrast, elected State and Congressional officials are directly and democratically accountable. Unlike unelected bureaucrats from the FDA and USDA, elected officials know that if their actions and voting records are not in accordance with the wishes of the majority of their constituents, they risk losing their jobs – and hence, their livelihoods – at the next election. As such, in this writer’s opinion, American citizens would be best advised to direct the majority of their energies into writing and lobbying their Senators, Congressmen and elected State officials. Remember that the FDA consensually agreed – in 2004 and again in 2005 – to the adoption by Codex of its EU-inspired global Guidelines for Vitamin and Mineral Food Supplements. As such, elected government officials – not unelected FDA bureaucrats – are now the last line of defense against the harmonization of U.S. dietary supplement legislation to restrictive European standards.